This is my second attempt at making quinoa. My first was the garlic quinoa with Parmesan cheese which I had to admit was not quite what I thought it would taste like. So this time I decided to go a different route. I decided to try it in a breakfast recipe and this one was a winner for me. If you read my blog you know that breakfast is my favorite meal of the day. I have to say that quinoa was a great way to start my day. 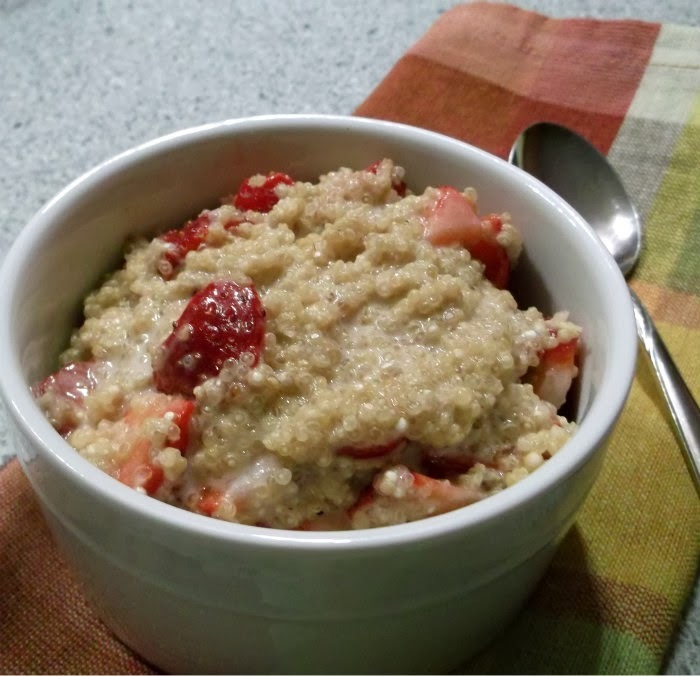 I loved the bit of sweetness the brown sugar added to this breakfast and the strawberries went perfect with the quinoa. 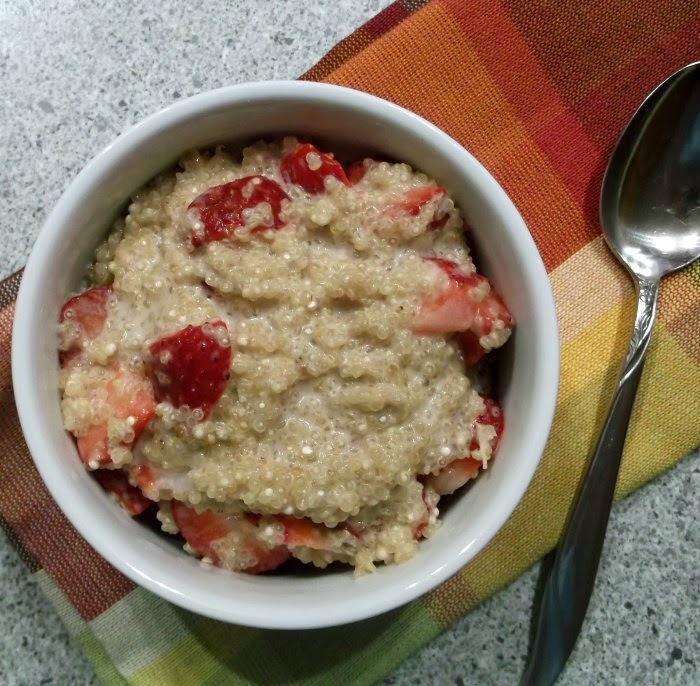 I think that even if you are not a big fan of quinoa that you may find that you like in a breakfast dish such as this one. Now that I have enjoyed breakfast with quinoa, the wheels have been turning and I can’t wait to try it with different flavors. 1. In a small pot combine quinoa and water. Bring it to a boil and then reduce to a simmer. Cook for 10 to 15 minutes, until the quinoa is tender. 2. Keep heat low, add the cream, and the brown sugar. Allow the sugar to melt and the quinoa to absorb the cream. 3. Add the diced strawberries and stir, allowing them to heat through. 4. Spoon the quinoa int a bowl. 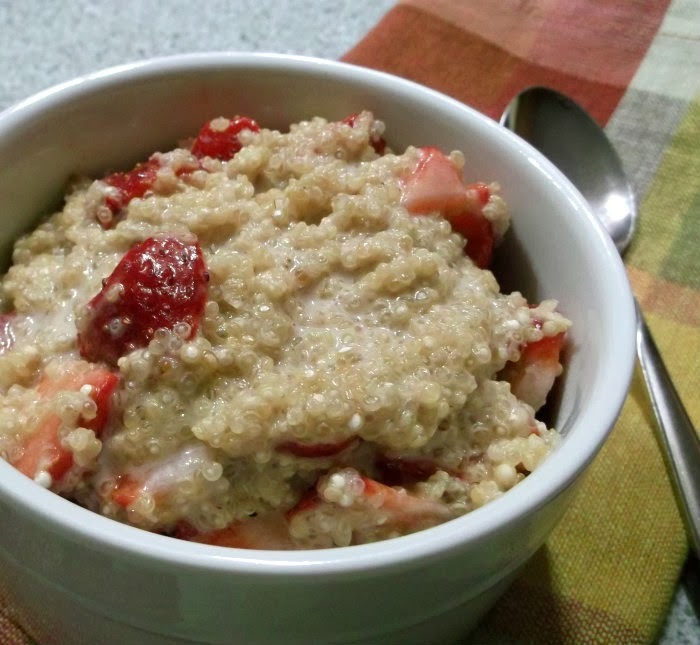 I still have yet to attempt quinoa for breakfast…but with strawberries and cream I absolutely MUST. I’ve not tried quinoa for breakfast. Sounds delish! Certainly this recipe is terrific – thanks for this. I wish I was having this for breakfast today! It looks tasty. Delicious way to start a day…sounds and looks delicious Dawn, especially with fresh strawberries.